Thank you for joining me as we count down to the next MFT release. We are five days away from the big day! All the new Stamps, Die-namics, and Stencils will be available on Tuesday, June 2 at 10:00pm EST. Be sure to check out the MFT Blog to see all the new items being revealed today. Don't forget to leave a comment on the MFT Blog countdown posts, YOU could win one of the five $75.00 gift vouchers. I have a couple of cards to share with you today, the first one features the new Written in Watercolor stamp set. I created a water-colour background with a few Peerless Watercolours on a piece of thick mixed media card stock. 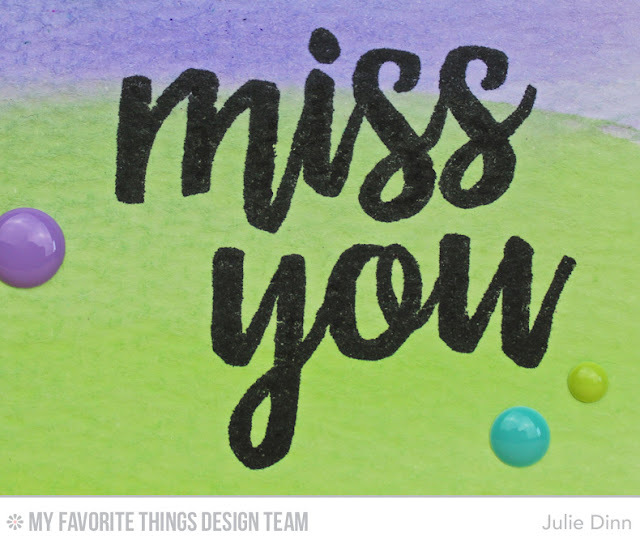 Once the card stock was dry, I stamped the sentiment from the Written in Watercolor stamp set in Black Licorice Hybrid Ink. 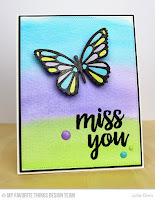 The MISTI definitely helped when stamping this sentiment as the card stock is rather bumpy and I needed to re-stamp it a few times to get a solid image. 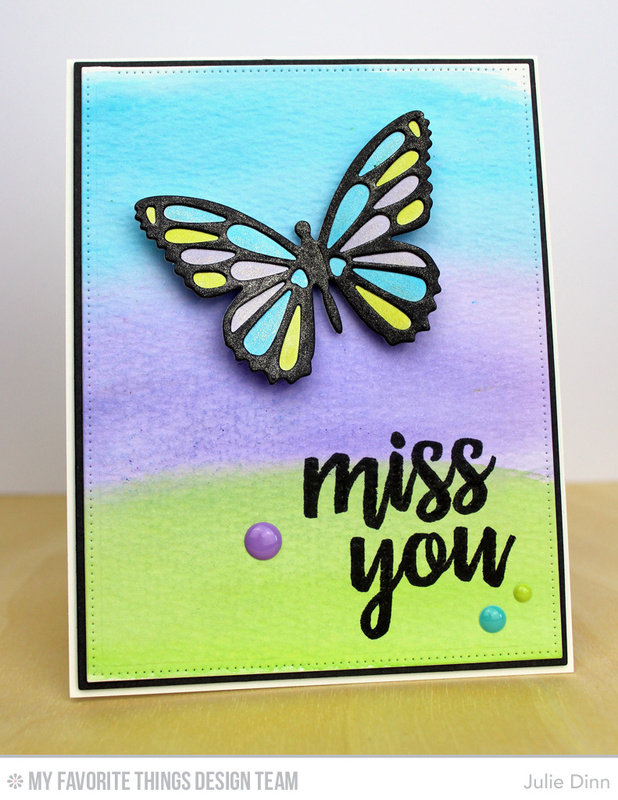 The gorgeous butterfly was created with the new Flutter of Butterflies - Solid and Lace Die-namics. 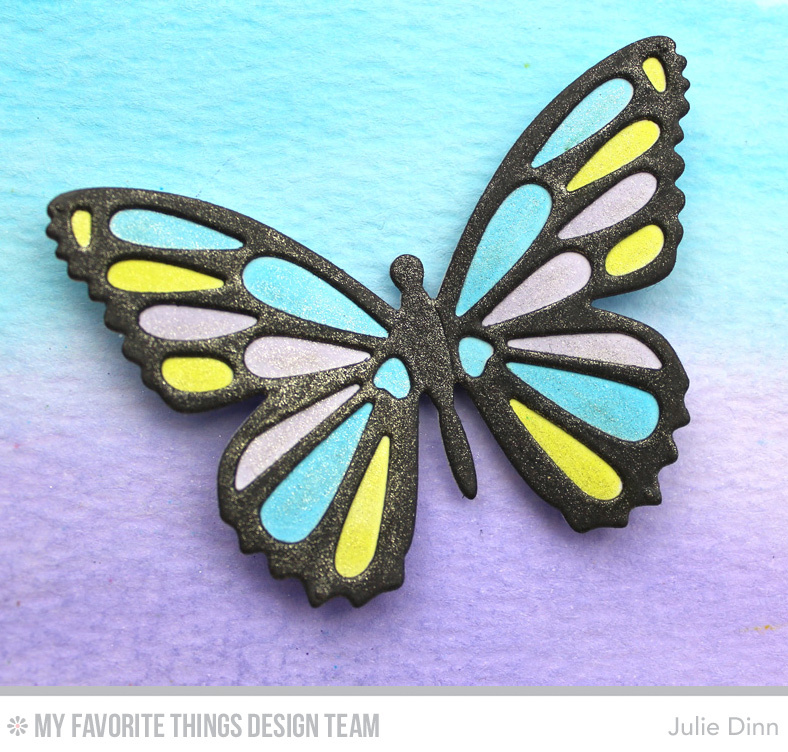 I die-cut the lace butterfly in Steel Grey card stock, the solid butterfly was die-cut in Smooth White. I colored the butterfly with Copics before adhering the Steel Grey lace butterfly. The entire butterfly was covered with a thin layer of shimmer with the Wink of Stella pen. My second card, features one of the four new Zig-Zag Stitched STAX Die-namics. These new stitched dies are incredible! I love the subtle detail these dies add to a card. 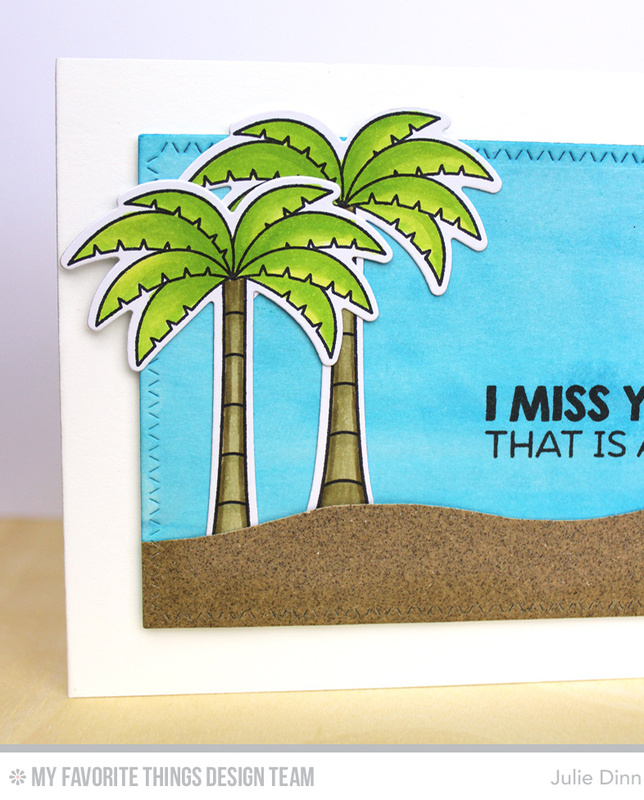 I paired the Zig Zag Stitched Rectangle Die-namics with the new Birdie Brown set, Penguins in Paradise. I know, there are no penguins on this card, but you will see lots of them tomorrow! The fabulous palm trees were stamped on X-Press It card stock with Black Licorice Hybrid Ink and they were coloured with Copics. I used a piece of sandpaper for the sand. Stunning cards! Love the colors! And the sentiments are just gorgeous! WOW, great cards Julie. Love the scene on your second one. So fun! Wonderful cards. The butterfly intrigues me. Thanks for such great showmanship of products. Love both of your cards. The butterfly is gorgeous! 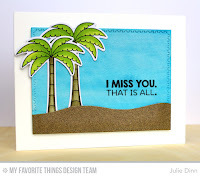 Love your butterfly card and the palm tree scene. Love the different colors on the butterfly.. I don't know how I lived without my MISTI. I love your color choice in your first card!